Memoryman (aka Uovo) is one third of Pastaboys, possibly one of the biggest Italian dance music exports of the last 15 years. 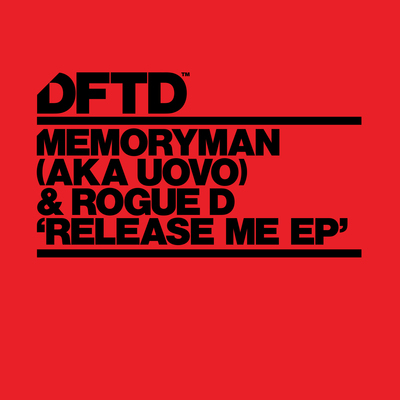 Joining forces with Rogue D (formerly of Flashmob) for two melodic but contrasting tracks, this forthcoming ‘Release Me EP’ demonstrates sophisticated instrumental arrangements over refined mood-defined beats. 'Release Me' is an extended track, giving due care and attention to a deep and rolling crescendo build, the soaring soul-style vocals and percussion accents gradually taking things up to a euphoric level. ‘Dance Track’ is the mid-tempo counterpart to ‘Release Me’, built around a smooth guitar hook that removes it from the former’s dancefloor and into the realms of a minimalist take on deep house. It’s out 20 January 2017 on DFTD.